Recently, I took a very pleasant group of people to a small city by the water. Their final destination was approximately 50 minutes away. I picked them up at the airport. They were here in Michigan to spend the week of July 4th by the water. Uber Payout: What did the passenger pay, and what did I make as the driver? Actual Payout: What are my earnings after my operating costs (time, gas, and ongoing vehicle maintenance)? Return Trip “Fee”: What does Uber say about upfront return trip reimbursement requests? So as I stated, I picked them up at the Grand Rapids International Airport and drove them to Douglas, Michigan (please see attached image). As you can see from the trip log, the ride was 47.13 miles and it paid me $55.43 without tip. This group was awesome because they tipped me $10.00 on the app and gave me an additional $20.00 in cash. My take was $85.43 for this ride. Most rideshare drivers calculate their hourly earnings based on these numbers. Minutes Driving: 49 one way, or 98 minutes round trip. I could have stayed in Douglas and received requests, but I decided to head back towards the airport in hopes of getting another long ride. Now, some will say, that $22/hour is not a bad hourly rate. However, we still have not taken my operating costs into consideration, which are my gas and vehicle wear & tear. According to https://www.fueleconomy.gov/trip/ the gas cost of this trip is $10.24 there and back. According to https://www.rideshare.com/calculators/commute-cost-calculator.html wear & tear is approximately $0.17 per mile for my vehicle, meaning the cost for this ride is (94.26 miles): $16.02. FYI: wear & tear is defined as vehicle depreciation, tires, and ongoing vehicle maintenance. Now let's do the same calculation as before, knowing that I spent $10.24 in gas and $16.02 in wear & tear, or a total of $26.26. Knowing that operating costs eat into the apparent “profits” of long rides, some rideshare drivers ask their passengers to pay a “return fee” since the driver is far out of their home city. This is negotiated before the ride starts, and some passengers have refused to pay such a fee. Is it against the rules to request an upfront “return fee?” The short answer - nobody can be sure. Uber’s Terms of Service are vague when it comes to this. 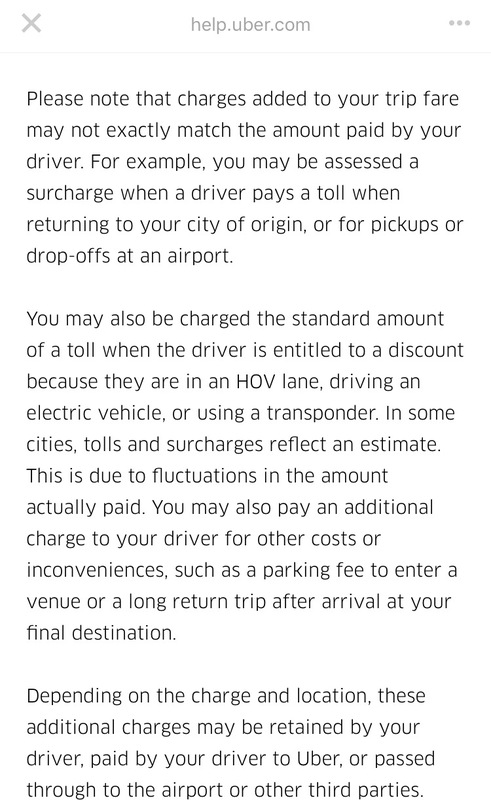 Uber also recently changed their verbiage about fares, tolls, and fees. Compare what the Terms of Service said in 2017 to the current verbiage in 2018. So can you be deactivated for asking passengers to cover your return trip costs? We at GR Rideshare Adventures have not heard of this, but we do not know for sure. We spent a considerable amount of time digging through Uber’s policies and could not find a clear cut answer. If you request a “return fee,” be prepared for the passenger to say no and exit your car to request a ride with someone else. If the passenger reports you to Uber, you may risk being deactivated. I realize there are still things I have not taken into consideration, such as mileage reimbursements, taxes, etc. Mainly I left those out because they are really hard to decipher on a single trip level. We may follow-up on this article by looking at an entire month and/or year. I do think though that these numbers show how significant the additional tip/return fee is. That being said: It is my opinion that a tip should be based on service level. Remember, this is a service industry, and if you expect a tip, make sure you do your part!